I’m not sure anyone is entirely sure about Britain’s future investment in science after Wednesday’s speech in parliament on the cuts. I was in Westminster to photograph other things, but caught a glimpse Chancellor George Osborne sitting in a car looking fairly pleased with himself as he left Parliament after giving the speech in a small part of which he confirmed that the government was going to protect the confirmed that the £4.6 billion per year science budget to make sure the country retains its position at the leading edge of technological advances. I’d stopped to chat briefly with one of the group of photographers standing ready to grab pictures as the cars drove out, but decided not to get in their way as they leaped into action as the car approached. They had their job to do and I was in any case not ready for that kind of grabbed picture had I wanted to try. I don’t personally find such images of great interest, although the papers do often seem to use them. It will have come as good news to the couple of thousand white-coated demonstrators I’d photographed ten days earlier outside the Treasury in London, but many of them will also have been worried by the 40% cut he also announced for teaching budgets in Higher Education, which may well mean fewer jobs in the sector as well as higher fees for students. So things may be getting pretty tough in the next few years in our universities. 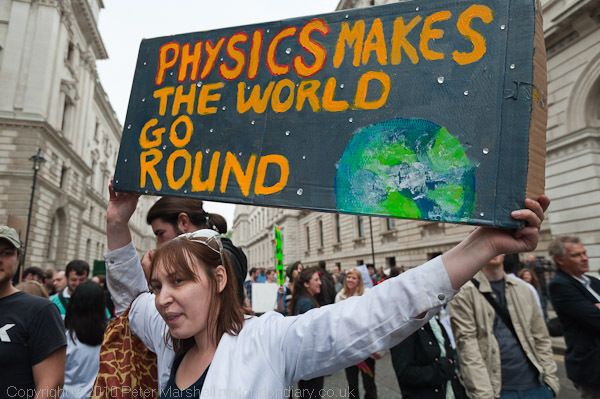 The scientists had done their best to put on a show for the demonstration, with some placards with snappy slogans, some scientific celebrities and even two science comedians, but it was still a more subdued crowd than at most demonstrations, and perhaps lacked the drama that makes for the best photographs. Of course one can’t tell if this protest had any effect on the chancellor, but certainly the media coverage it gained will have made it easier for him to make the decision to protect spending in this area. 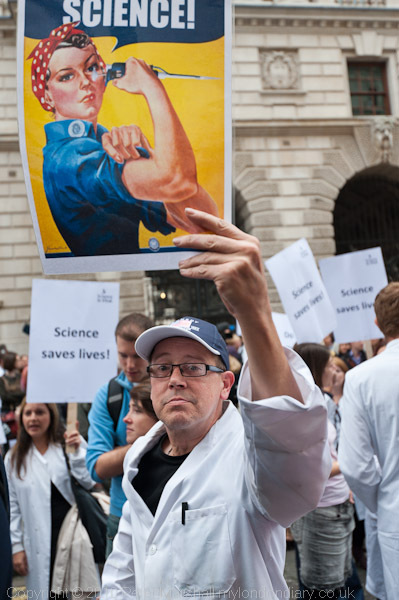 You can see my report which went on Demotix on the day of the demonstration and more pictures in Don’t Cut Science on My London Diary. This entry was posted on Saturday, October 23rd, 2010 at 08:52 am and is filed under My Own Work, Political Issues. You can follow any responses to this entry through the RSS 2.0 feed. You can leave a response, or trackback from your own site.